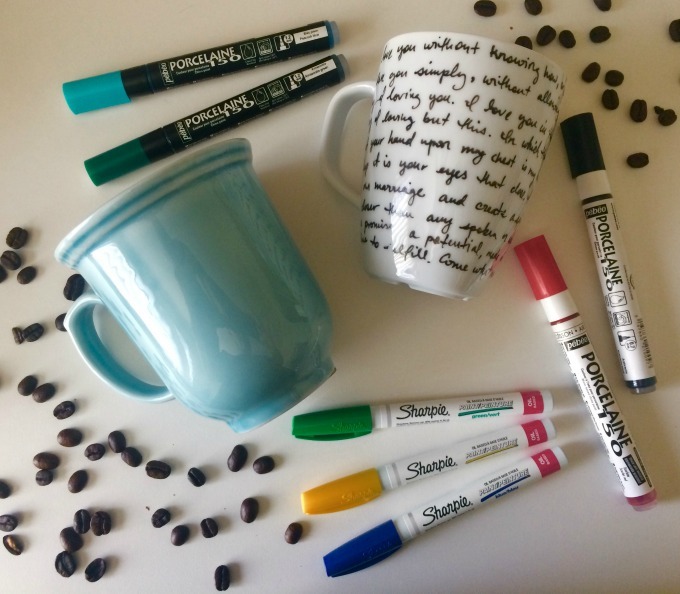 Another one of my fairly quick go-to DIY gifts are personalized mugs! And since we all know how essential caffeine can be in motherhood, why not give the gift of housing that sweet nectar!! Like your penmanship, find a fun quote! Want to use a stencil and monogram your mug, go for it! Feeling artsy fartsy, draw whatever inspires you!! This is a fun creative gift that always gets a smile! Get Clean!! Make sure your mug is washed, clean, and dry. Get creative!! Use the markers according to their directions—most need to be shaken well then dab the tip of the pen until ink starts to flow. Make sure to have rubbing alcohol, q-tips, and paper towel for any mistakes you need to quickly fix. Take a break!! Mugs need to sit 24 hrs before baking. Get Giving!! Pack ’em up and hand them out!! *Sharpies can be found at most crafting stores and even Target. Personally, I prefer the Pebeo Porcelain 150 pens which are found at Art Supply stores. As you can see in the picture, I wrote on this mug 5 years ago, wash it in the dishwasher every few days, and not a single chip of paint has come off!!! **I suggest you crack a window during baking as it will get a little smelly in the kitchen. I plan on making several for my ride or die mamas. Without caffeine and their support, motherhood would be a whole lot more challenging! !